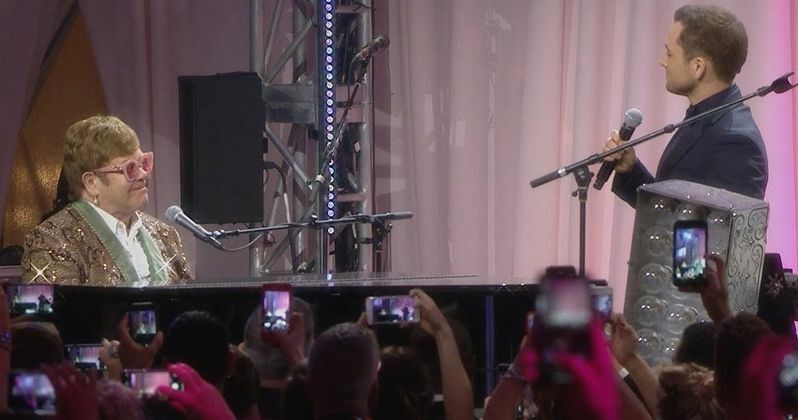 Taron Egerton, who is playing Elton John in the upcoming biopic Rocketman, performed one of the legendary artist's most iconic songs with him on stage recently, and we have the video to prove it. Egerton was invited as a guest at the 27th annual Elton John AIDS Foundation Academy Awards Viewing Party for this year's 91st Oscars ceremony. At one point, Egerton joined John on stage and the two performed a rendition of Tiny Dancer together. The video is pretty incredible, as a pure showcase of talent for Taron Egerton. The recent trailer for Rocketman, as well as a behind the scenes preview, showcased his singing ability and transformation into that key element of the role. Still, there are lots of tricks and doctoring that can be done in a recording studio and in a sound mix after the fact. But here, we see the Kingsman actor, with no tricks to hide behind, showcasing his singing ability, and it's truly impressive. Egerton truly learned to sing and the actor has also thoroughly proved that he's got pipes. Elton John, at first, just assumed his position at the piano and the two looked at one another in awe as they performed the hit song, which was originally released on his fourth album, Madman Across the Water, in 1972. To this day, it remains one of his most iconic and recognizable hits. Taron Egerton handled the verses on his own until the chorus finally hit and the two sang it with one another. Even though this has nothing to do with the movie, it is sort of like looking at a mirror and being able to see the Grammy winner decades ago on stage with his current self. Rocketman will chronicle the life of Elton John during his early years when he was breaking through as a major star. It promises to be an "uncensored" look at his life during that time period. Paramount is certainly hoping they can capture some of that same audience that turned out in droves to see Bohemian Rhapsody last year. That movie, which chronicles the band Queen and focuses on their late frontman Freddie Mercury, has been criticized for sanitizing many elements of Mercury's life and accurately portraying parts of Queen's history. Yet, it went on to earn $860 million at the box office and walked away with four Oscars, including one for Rami Malek in the Best Actor category for his portrayal of Mercury. Could we see Taron Egerton earning his first Oscar nomination next year for his portrayal of Elton John? Will this foreshadow things to come? Time will tell, but for now, we at the very least have this amazing performance to enjoy. Rocketman is directed by Dexter Fletcher (who ironically was brought in to finish Bohemian Rhapsody after Bryan Singer was fired) and hits theaters on May 31. Be sure to check out the performance from the official Elton John YouTube channel below.